The numbers of U.S. priests and seminarians have been plummeting for decades, and it's not just because of the church's sexual abuse scandals. SAN GABRIEL, Calif. — The Rev. Matthew Wheeler believes it's a good time to be a Roman Catholic priest. Wheeler, associate pastor at St. Anthony Catholic Church in the Archdiocese of Los Angeles, is one of the newest priests in the U.S. Catholic Church — he is 30 years old and was ordained in June. He knows how people see the priestly sexual abuse scandals. He knows that "if people look at a young man's decision to become a priest from simply a material perspective — to use biblical language, from a worldly perspective — in light of all these things, it doesn't make a lot of sense." Young Catholics shun modern life, embrace religion in U.K. But those people don't see "God's hand in it all," Wheeler said in his office at St. Anthony. He was studying accounting at the University of Southern California, he said, when God "challenged me to consider another dimension [and] aspect of life — the spiritual life." "It's about real holiness. It's about the truth," said Wheeler, who contended that abusive priests abandoned both of those concepts. "I think what we're experiencing with this sad, awful tragedy right now, much of it is true," he said. Priests like that aren't interested in holiness but are "men who were hiding out, men who wanted to use the church and the authority that would be invested in them to abuse and to be selfish and to take advantage of vulnerable people," he said. "There's a power difference now, and I'm called to be very, very discerning and very aware of that so that I don't take advantage or manipulate or hurt anybody." As it lurches from crisis to crisis — the Pennsylvania grand jury report alleging decades of abuse by hundreds of priests, state investigations in New York and New Jersey, the payout of $27.5 million to four young men who were abused as children in the New York Diocese of Brooklyn — the Roman Catholic Church in the United States is looking for men like Matthew Wheeler. It is looking for a lot of them. In the last 50 years, the number of U.S. priests who serve as day-to-day leaders of parishes — known as diocesan priests, as opposed to those who join religious orders — has dropped by almost a third, from about 37,300 in 1970 to about 25,800 last year, according to the Center for Applied Research in the Apostolate (CARA) at Georgetown University in Washington, D.C. Meanwhile, the number of U.S. Catholics who identify with a parish has grown by 43 percent, from about 48 million to about 68.5 million, according to CARA and the Official Catholic Directory, which has tracked church membership and other data for more than 200 years. That means far fewer priests are serving far more parishioners today. In 1970, an active parish priest served an average of about 1,430 church members; last year, he served an average of about 4,240, almost triple. Church leaders and scholars say there are many causes for the decline. While nearly all acknowledge that the sexual abuse scandals have cast a pall over the priesthood, they also cite other, longer-standing institutional challenges as primary barriers to new ordinations. CARA's data show that the priesthood began dwindling at a fairly consistent annual rate decades before the abuse scandals entered wide discussion with publication of The Boston Globe's coverage of the Archdiocese of Boston in 2002. More worrying for the church is that enrollment in seminaries began falling even earlier, as soon as it reached its modern height in 1968, when more than 8,000 men were on track for ordination. By 1974, the number of seminarians had fallen to about 5,000. It plateaued at about 3,100 in the mid-1990s, and since then, enrollment has remained stable. If it's not the sexual abuse scandals that are solely driving down calls to the priesthood, what is? At the heart of that question is another one: What should a priest be? It's a question that's at the forefront as the U.S. Conference of Catholic Bishops, like national bishops conferences around the world under the direction of the Vatican, embarks on an update of its Program of Priestly Formation, which was last revised more than a decade ago. There has been a sharp divide in Catholic beliefs worldwide since the Second Vatican Council of 1962 to 1965, or Vatican II, which sent the message that the church was part of the modern world. Parishioners became more involved in Mass and in parish life. Church leaders reached out to other denominations and even other religions. The church became more accessible — Mass is celebrated in local languages instead of Latin, and women have roles in the celebration. The divide has widened since the election in 2013 of Pope Francis, who has called for the church to be "anchored" to Vatican II. There are various ways to characterize the divide — conservative or liberal, traditionalist or modernist — but the most common is pre-Vatican II or post-Vatican II. The Rev. 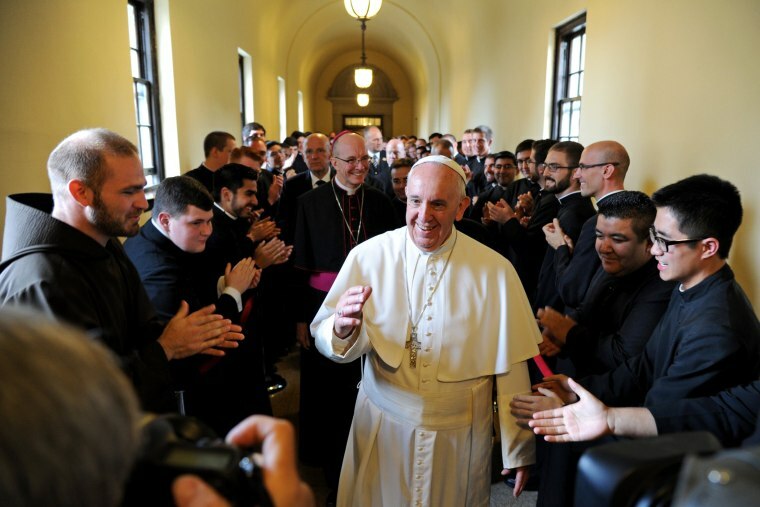 Donald L. Kloster, a priest in Bridgeport, Connecticut, wrote last year that the connection between the modernizations of Vatican II and the declining number of priests and seminarians is indisputable. A revival of traditional practices is likely to lead more men to seek ordination, not fewer, he wrote. "We need an exclusively masculine sanctuary," wrote Kloster, who called for priests to dress traditionally in cassocks and clerical suits and for Catholics to observe centuries-old penances like abstinence on Fridays and a monthly day of fasting. "Tradition is not a bad word," he wrote. Others, however, see that philosophy as estranging priests from their flocks and from the priestly candidates in them. Many priests "want things to go back 40 or 50 years," said the Rev. Ron Chochol, a retired priest in the Archdiocese of St. Louis, but "the world is a very different place today." Chochol heads a committee on priestly formation for the Association of U.S. Catholic Priests, a national organization of about 1,200 priests in active ministry. In January, the committee sent a report to the U.S. bishops' conference outlining how it could update the Program of Priestly Formation to address challenges facing the church, particularly the dwindling numbers of active priests and candidates for the priesthood. The report laments the status of a priest "as a role of authority and power over the people of God," when it should be a role of pastoral service to the parish. It calls for encouraging collaborative pastoring by getting candidates for ordination out of their academic bubbles and into the community. "Right now, they live in seminaries, and they live together," Chochol said in an interview. "That's all crazy. They're not going to be monks. They're going to be people who are supposed to serve people in parishes." Wheeler, the California priest, agreed that the days of the remote, authoritative parish priest are passing. "Blind obedience is gone. That doesn't work anymore," he said. "We can't just tell people this is what we believe and this is what we do and that's just the way we do it and so get on board. That's just not the young mind." At the same time, he said, "as a priest, you have authority whether you like it or not, and your relationships change forever." And that authority allows a priest to deliver a clear message with passion. People want truth, and "when the truth is brought to them sincerely, in love, I think they'll listen," he said. Experts say demographics is another major factor. Candidates are largely drawn from Catholic families, and like other families across America, Catholic families are shrinking. As recently as 1942, U.S. Catholic families had an average of three children, according to research by CARA. Generation X Catholics, by contrast, average only two. By 2015, the last year for which complete figures are available, 62 percent of all adult Catholics had no minor children living in their households. "Today in the large metropolitan areas, the one- or two-child family, even among Hispanics, seems to have become the norm," the Rev. Mark Pilon, a retired professor at Christendom Graduate School of Theology at the University of Notre Dame, wrote in the journal The Catholic Thing. Alluding to the celibacy requirement for Roman Catholic priests, he asked: "Is it unreasonable to presume that they might want grandchildren more than a priest in the family?" Celibacy is also a real, if lesser, barrier, research suggests. Research by CARA in 2012 indicated that the celibacy requirement is the second-most-common reason young men don't consider pursuing a vocation as a priest or a religious brother. Almost a fifth of those surveyed cited celibacy as a barrier, behind only a "general lack of interest." The requirement also discourages women from pursuing vocations as religious sisters, again trailing only a general lack of interest, according to CARA. Fewer priests, but better priests? The decline in the overall number of parish priests is likely to accelerate, scholars say. A huge cohort of priests who were ordained in the wake of Vatican II is aging and dying. And they aren't being replaced at anywhere near the same rate. To Chochol, that may not necessarily be a bad thing. He pointed to the permanent diaconate, in which deacons are ordained as ministers of the church, authorized to carry out many of the duties of a priest, including conducting baptisms, wakes and funerals and officiating at weddings. Deacons can't celebrate Mass or hear confessions; on the other hand, they can be married and pursue outside careers, which makes becoming a deacon attractive for many men, Chochol said. When you factor in the increasingly prominent role women play in lay ministry — women make up about two-thirds of paid lay ministers in the U.S. church, according to the U.S. bishops conference — the striking decline in the number of priests doesn't necessarily translate to a critical shortage of faith and parish leaders, he said. Men and women alike "are discovering different ways in which they can participate in the life of the church and make a contribution but without having to give up marriage," he said. Democratization of leadership is a strength, he said. It means priests "not only don't have to do all the various things that come their way, but they shouldn't do all those things," he said. At his church in San Gabriel, Matthew Wheeler looks at it this way: There are fewer priests in the pipeline, but they're there for the right reasons. There was a time in the United States when people of different backgrounds were expected to go into specific professions — it was a stereotype, for example, that first- and second-generation Irish-American boys would naturally gravitate to the priesthood as a "cultural vocation." But in 2018, cultural vocations are largely a thing of the past, Wheeler said. Today's priestly candidates are in seminary because they passionately want to serve the church. "Oftentimes, guys, I think, who become priests today, it's out of a real love for Christ," he said. "I think in the United States, our culture is such that vocations are being fueled by an authentic encounter with Christ that they want to share in the ways that only a priest can — which is through the sacraments."